Have you found any decent Hallowe'en beers this year? They've become something of a staple in the UK, and are starting to appear now in other European countries too, even though none of it reaches the heights of obsessiveness that American drinkers must endure. Part of the problem is the obsession with pumpkins. These American gourds have relatively little flavour of their own, and to bring out any sort of decent flavour out of them you need spices. Ginger is my preference here, but brewers and bakers tend to go for the likes of cloves, nutmeg and cinnamon instead. So what you get is mostly just a spiced beer - a few brewers even admit there's no pumpkin in their Hallowe'en beer, and that where the label says "pumpkin-spiced ale" it is 100% accurate - it is spiced with "pumpkin spices". One pumpkin beer that's fairly widely available is Wychwood's Pumpking, I've had this year's edition though and it was overwhelmed by burnt caramel flavours and generally unimpressive. 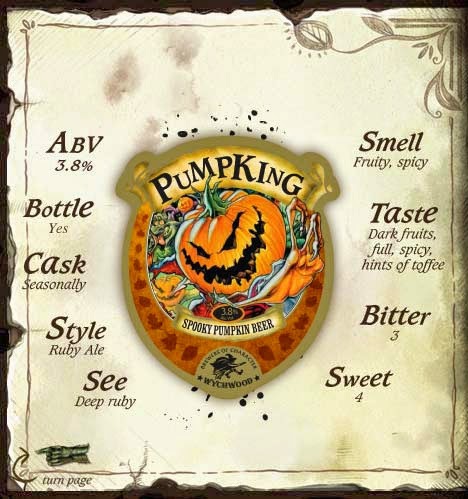 The same brewer's version of Night Owl Pumpkin Ale, based on a recipe from US brewery Elysian and brewed for the current Wetherspoon real ale festival, was rather better - at 6% it's also almost double the strength of the distinctly non-kingly 3.8% Pumpking. 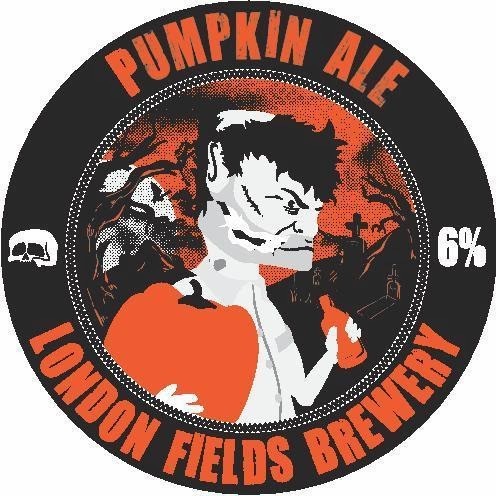 The best so far for not being over-spiced was this year's London Fields Brewery Pumpkin Ale, launched during a Hallowe'en party at the brewery tap in Hackney last night. Another 6%er (last year's edition was 6.6%), it's properly beery as well as being spiced. Sadly, the same wasn't true of the other ale London Fields launched last night. Called Gyle 666 (presumably because it was their 666th brew - they are currently brewing at least 10 times a week!! ), this is a chilli brown ale, but even 6.6% ABV isn't able to save it from being over-sweet, over-chillied and a tad one-dimensional. Look out for the LFB Pumpkin Ale though - and also the Night Owl, if your local Spoons hasn't sold out already. I think your statement, about pumpkins being virtually tasteless hits the nail on the head, Bryan. We were having a discussion at work today along these very lines; not specifically about pumpkin beer but about pumpkins in general. None of us can understand the American obsession with the things! When I was last in America it was the run-up to Halloween, and pumpkins were everywhere. Now like the “red weed” in the “War of the Worlds”, pumpkins have spread to this side of the Atlantic. I don’t recall ever seeing a pumpkin, when I was a child, but now, at this time of year, the supermarket grocery counters are full of the wretched things. I’m certain that most are sold either as decorations or to be cut out to make pumpkin lanterns. I certainly won’t be going out of my way to try any pumpkin beers! Yes, pumpkins on this side of the pond seem to be a thing of the last two or three decades, and to be fair, once suitably spiced to bring out the flavour - and I don't think it is merely that they are good carriers of other flavours! - they do taste of something. I made pumpkin soup with plnty of ginger and some Thai spice, and it worked pretty well. But yes, in beer it's rare to detect much pumpkinness, and perhaps it is not necessary anyway - just go with the spices! But do it subtly please... On which note, I have a new favourite spiced beer: Gale's Firecracker. Apparently (and incredibly) it's Fuller's first spiced ale. Gorgeous stuff, with just enouth spices to make it interesting without being overwhelming. A friend of mine from the US explained to me that pumpkin pie is very big in America, but it's not made from whole pumpkins, it's made from tinned pumpkin, which is heavily sweetened and spiced, and that's where the flavour comes from. I can't say I'm keen to try the pie, let alone the beer, whichever side of the Atlantic it comes from! For pie I can well believe it, though hopefully not for beer! Although it's presumably the tin's well-known spice mixture that the US brewers ape. Tinned pumpkin? I've heard it all now. Sounds revolting!